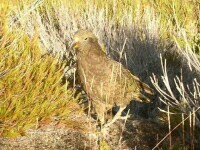 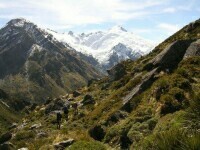 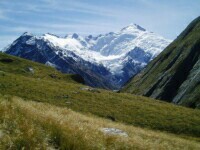 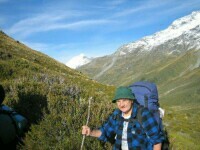 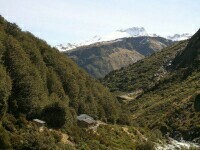 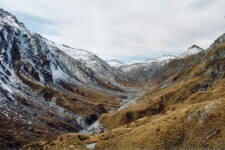 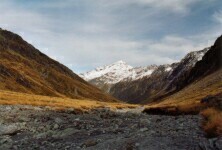 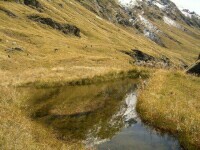 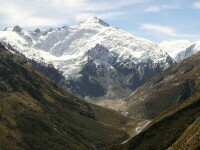 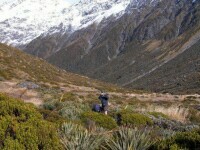 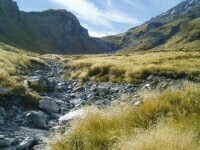 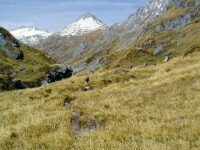 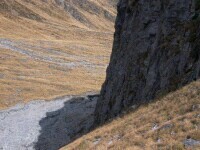 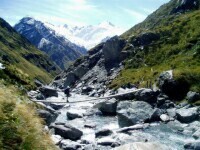 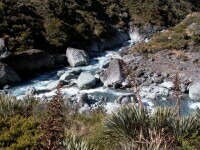 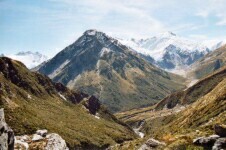 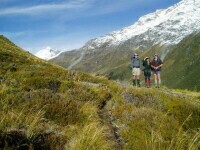 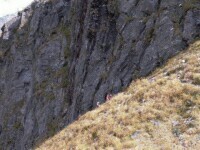 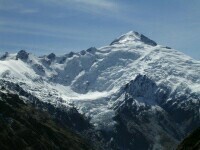 Day 3: (Monday 13/03/06) The morning was fine and boded well for an excellent crossing of the Rees Saddle. 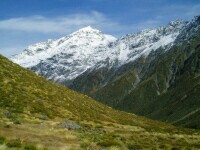 As we gained height we had views back to the Mt Earnslaw peaks until the trail swung too far to the right (east). 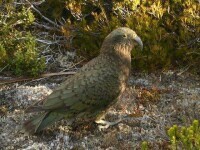 Those ahead took appropriate photos while I tried to get more kea shots. 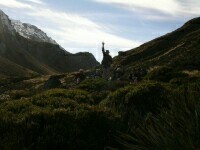 The valley rises more steeply as we head to the Saddle and the Forbes Peaks crowd in. 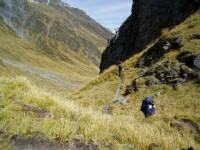 Initially it is difficult to see where the track will go but eventually a short steep climb becomes obvious (and reassuring). 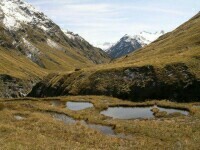 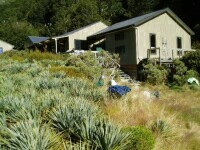 At the top of the tussock basin there is a relatively short 100m climb to the saddle (1447m) where there is a large tarn and beyond this a small hill worth climbing to obtain 360° views of three valleys. 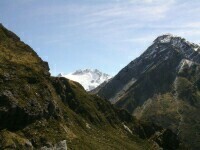 The rock dome on top is quite safe unless one tries to take a 360° video and steps off the edge (as I did!). 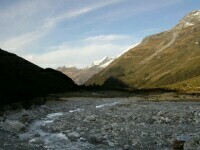 Luckily there is no audio track on my camera! 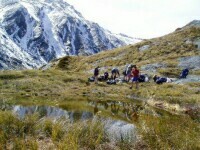 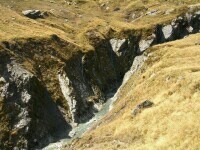 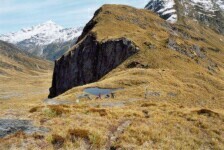 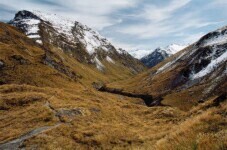 There is a rapid descent from the saddle to a terrace on the side of Mt Cunningham containing a number of tarns with the Snowy Stream passing below in a gorge. 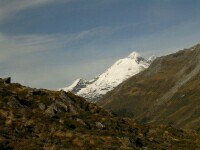 The Humboldt Tower, Hesse Glacier and Mt Edward become progressively more visible and distracting. 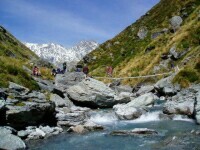 A further drop takes you to a swing bridge and from then on the views of the Dart Valley with its various glaciers becomes even more magnificent. 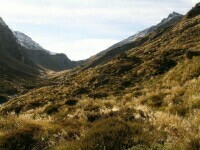 There are wonderful panoramic views of the upper Dart system dominated by an unnamed southern spur of the Humboldt Tower. 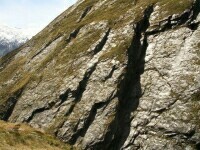 The track continues to drop into the Dart, and it was here, as I was hurrying to catch up, that I rolled my ankle badly. 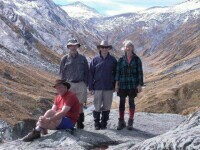 Years of demonstrating to patients how to keep the lateral ankle ligaments elastic paid off as it became clear I hadn't ruined anything. 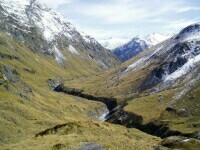 The track finally crosses back over the Snowy immediately before the Dart Hut.